Why did I read this book: I really, really enjoyed Divergent, the first book in this trilogy. I wasn’t expecting to love that novel as much as I did, and yet by the end of last year, Divergent had made its way onto my Best of 2011 list! Naturally, I could not wait for the release of Insurgent, and the book quickly shot to the top of one of my most highly anticipated releases of 2012. Following the shocking, deadly events at the conclusion of Divergent, Insurgent opens with a devastated Tris as she struggles with the loss of her parents and her guilt over killing her friend, Will, while he was under the influence of a mind-controlling serum. In the attack on the city, using brainwashed Dauntless soldiers as manpower the Erudite gunned down Abnegation members before Tris and her friends could stop the simulation, leading to a mass execution of most of the Abnegation faction. In the aftermath of this devastation, the remaining Dauntless faction has split between traitors that have allied with the Erudite, and outcasts that are systematically being hunted and killed by their former faction-mates. Since thwarting the attack and stopping the power-hungry Erudite before they could sieze complete control of the city, Tris, her boyfriend Tobias (the Dauntless leader formerly know as “Four”), her brother Caleb (an Erudite defector), and a handful of Abnegation survivors have escaped with their lives and have turned to Amity for safehaven. While Tris and her friends find temporary sanctuary amongst the peace-loving faction, their respite is brief as it becomes clear that Amity will not take a stand in the conflict between factions, nor will they seek a fight with the formidable army of Erudite and Dauntless. Forced to leave the neutrality of Amity, Tris, Tobias and others seek out the only other remaining groups for aid – Candor (the honest) and the Factionless. In their quest to find support, Tris and her friends are sorely tested. Friends become enemies. Secret alliances and truths come to light. And even the bond between Tris and Tobias might not be enough to withstand the forces that threaten to tear them apart. So, all cards on the table: I was not as enamored with Insurgent as I was its predecessor. Don’t get me wrong! Insurgent has many of the elements that I loved in Divergent – there’s action, some truly conflicted characters, and great plot twists along the way. By that same token, there is a frustrating amount of repetition, action that doesn’t really amount to much in terms of advancing the actual story, and so much angst/PG sexual tension/overall emo-ness as to detract from the awesomeness of said characters. First, the good. I love that the book begins immediately following the dramatic conclusion of Divergent, with Tris, Tobias and their ragtag group of survivors seeking help and nursing their wounds. As a character, Tris is deeply hurt, not just physically with her shoulder injury, but with the consequences of her actions after killing a good friend – a secret that she guards very closely from Tobias and everyone else. I love that Tris is so conflicted for much of the early part of this book, unable to even touch a gun without recalling the trauma of killing Will, unable to deal with the huge gaping pain of her parents’ deaths. Tris, in turn, locks down and tries to protect herself from future pain, even from the boy she to whom she so desperately needs to open up. I love this about Tris – her resilience, her pigheadedness, her abrasiveness (rooted in the best intentions, of course). At the same time…the pigheadedness and abrasiveness got a little old after a while as her secretiveness and hurt drives a huge wedge into her relationship with Tobias, and serves merely as a mechanism for teen angst. There’s a lot of that in this second book (not nearly so much fun as jumping from buildings, Dauntless initiations, and uncovering secret plots, let me tell you). There’s a lot of Tris and Tobias sharing passionate crushing kisses with…nothing happening afterward. It’s all very PG-friendly, “his hands skimmed my shoulderblades” and “I pressed myself against him urgently, burning and melting” and…that’s it. Theirs is a chaste relationship of passionate kissing, in great traditional romantic YA fashion – the dreaded S-word never enters anyone’s mind, or before it does, Tris and Tobias are back at square one because she’s pushed him away to deal with her angst/he’s pushed her away because he can’t protect her and it’s killing him (gag)/you get the picture, right? I am not a fan of these protracted angsty love stories. It’s comedic, because of the chastity; it’s frustrating, because SO MUCH TIME is spent on these exact. same. exchanges. repeated ad nauseam – meanwhile, there’s a WAR going on, people! Needless to say, characterization in this novel and the focus of so much of the book on Tris and Tobias’s romance kind of bummed me out. On to the story proper: I love the interplay between factions, and the way that Ms. Roth has effectively set the Erudite bullying their way to power through the more amenable/less fearsome factions. Candor is cruel in its own honest way, and Amity seeks peace over conflict at all costs – this serves the Erudite interests very well. That said, there’s something comedic to the evil of the Erudite, and I still have a hard time believing the motivations for seizing power and for wanting to test on the Divergent (surely, it would be much easier to kill them – and I’m not talking some injected serum that can be faked. I’m talking bullet to the brain, here.). Surely there are better ways of seizing power – but in the grand tradition of inept villains and villaineses, those responsible parties in Insurgent go the circuitous route, monologuing, allowing their seemingly-defeated victims a chance to get away and thwart their dastardly schemes. Yet, while the Erudite and their schemes felt a little disingenuous, I was happy with the inclusion of the Factionless in this book and the importance of the Divergent population overall. There’s a huge hulking twist by the end of the book that isn’t exactly unexpected (and it’s certainly not very plausible – when you start to think about this society, the ages of people, the fact that there are DIVERGENT that should be immune to said twist – it doesn’t quite add up). That’s ok though. I like the twist. It is the stuff of crazy bordering on ludicrousness, but I actually love this big ol’ Twilight Zone/LOST/lunacy. I’m excited to see how this all shakes out in the next book. All criticisms said, maybe my under-enthusiasm for the book is really a case of ‘it’s not you, it’s me.’ Almost all of the reviews I’ve seen thus far for Insurgent sing the sequel’s praises as being better than its predecessor. For me? I’m still invested in the series, I’m still excited about Tris and her adventures, and I still definitely enjoyed this book – I just wasn’t blown away. We’ll see how everything shakes out with the release of book 3. Or go HERE if you have problems with the embedded reader. Interesting. I was so caught up in the big reveal I didn’t think about the ages of the people and what being Divergent should mean to that reveal. Wonderful, brilliant review. I can’t wait to read this book. I might have to get it today when I go to work. Also, that excerpt has me really want to read more. Today. Right now. I was kind of cracking up at this review because you captured two of my biggest gripes–the ridiculousness of the ending twist and the fact that they are always passionately making out and it goes nowhere. The thing I couldn’t handle the most, though, was sentences like this: Tris, A, B, and C were all walking and then they saw D, E, F, and G doing something. *gaps* What were they doing there?! I felt like I was always supposed to be surprised at what people were doing but in reality, I had a hard time remember who everyone was. Maybe this is because I didn’t reread Divergent beforehand. Anyway, love this review. Amy – Thank you! We try to keep it real over here in Book Smugglerland 😉 (And wow the Insurgent stuff has been ALL OVER THE PLACE, hasn’t it? Talk about book fatigue…) I did like this book but it wasn’t nearly as fun or addictive as Divergent for me. I’d be interested to see what you think when you’ve had a chance to read it! Pam – It was a crazysauce reveal, right?! I have to admire its brilliant abandon, plausibility and credibility gaps aside. Ashley – I hope you enjoy it!! Great review! I love BookSmugglers’ well thought out critiques! I have the book and haven’t gotten around to reading it yet (gotta see what happens with Sookie and Bitterblue first). I’m pretty much one of the gushing reviewers when it comes to this book. Preferred it to Divergent. I know it has its flaws. I felt like a lot of the characters didn’t have as much depth as they should have. And I found it incredibly annoying that here they were saying I LOVE YOU and killing others for each other and trying to save the world, and they were still stuck on first base. Like just get on with it already. I’m not a fan of four really, so maybe i don’t see the two as a couple as something important anyway. It was highly entertaining though. And although the above things grated me, I think overall i just had such a lovely reading experience with it and so much of the good outweighed the bad that I leaned towards a higher rating. But yeah, you make some very good points. And I can completely see why you would be let down in some aspects. Thea–For sure. I was scheduled to review it today but I just couldn’t get my thoughts together, especially considering the fact that basically every word on it has been so positive. I was beyond excited to read it but the saturation of my Twitter, Goodreads, and RSS feeds about factions, Insurgent hashtags, picking sides, giveaways, etc. leading up to the release just overwhelmed me. To make a completely inappropriate yet apt statement, the anticipatory foreplay had waned and I’d already *cough* “finished” before I even read the book. I was not in a forgiving mood. I haven’t read this yet, and I probably won’t be able to for some time, but I did really like your review. I agreed on a lot of your points about Divergent, which I felt was not great when I read it, and yet on reflection I started to like more and more. I am curious how you’ll feel about Insurgent at the end of the year? 😉 I have heard more complaints about the relationship between Tris and Four. I’m not looking forward to that part of the book. What I am looking forward to is seeing more of the other factions. Okay, I just realised that my comment reads very confusing (it made perfect sense in my head). I was referring to your Divergent review of last year in the first half (mostly) and my expectations were for Insurgent, of course. I also was very let down by this book. Divergent was probably the best book i read last year, this book just frustrated me with the ever changing settings and people. Almost like it waS very rushed and all this action had to be crammed in one book. Your review hit all my thoughts on point..
One dumb question i guess lol..
what do you mean by some divergent being immune.. Excellent review–I agree with you on a lot of it. I really liked Divergent (I wouldn’t say I loved it, but I thought it was compelling and fun). I like Insurgent provided I don’t think about the logical gaps, especially with the reveal at the end. I’ll try to say this without being too spoiler-ish: there’s no way Tris and Tobias would have stopped at first base in parts of Insurgent. If they’d engaged in a deeper (poor joke intended) physical relationship that would have really upped the ante for Tris’ later decision making. It would have added a believable level of confusion to her feelings and confusion over everything that’s happened during the two novels. YES! Thank you! I rushed through Insurgent in a couple of days and then kept searching online for someone who shared my mixed feelings. This is the first review I have found that really captures why I felt the second book was a bit of a let-down (though still a fun read). I completely agree with you about the Tris/Tobias relationship getting really annoying. Beyond even the physical awkwardness of the hot/cold make-out scenes, I found their emotional relationship to be pretty jacked up. She supposedly “loves” him, but won’t open up about any of her feelings about Will or her parents and does not seem particularly bothered at throwing away the whole relationship to pursue her hunch about the Abnegation secret. (It’s not like Tobias is very forthright in this period either.) I don’t know. The whole thing confused me. I guess I just didn’t ever feel like they were together in any sense of the word, so I couldn’t make myself care about the relationship. 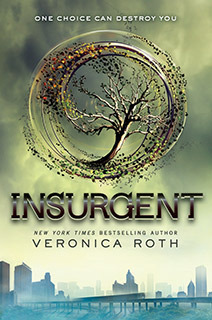 I loved Divergent and was sooooo excited about reading Insurgent. I have now read it and…well…to say I am disappointed is an understatement, if it hadn’t been on my kindle I would have thrown it against the wall in frustration! Tris and Tobias, get over yourselves, sheesh! Tris, stop going on an on and on about the same things, I know your conflicted but get a grip as it makes for an aggravating read. So much of the plot felt contrived and Im not convinced I will read the next book…I will wait to see your review of it first before I decide whether to invest my time and money in it. I also am curious about your comment about the Divergent being immune to something in the big reveal…but really don’t feel I want to re-read the end to figure it out…I was just glad to get to the end so probably was paying enough attention!!!! I found the end to be contrived, but I guess the next book will deal with that part. I hope anyways. I thought the physical relationship between Tris and Four actually made a lot of sense. Neither of them really committed to the other, so they did not really feel ready to go any further. They have a horrible example of emotional intimacy that hopefully will be resolved, but I truly never felt any chemistry between the two of them. I am just glad it isn’t a love triangle. I really hate those. I do think it is interesting that I loved it while I was reading it, but after, my love for it has been decreasing. I felt the same with Divergent too. I just finished Insurgent yesterday and I thought it was amazing. I definitely thought it was better than Divergent and I absolutely loved Divergent. I am not sure if you have read the Maze Runner Trilogy by James Dashner, but I will assume you have, and like the Divergent Trilogy I love the Maze Runner Trilogy. Now this is where my question comes in: By the ending of Insurgent couldn’t you see the Divergent Trilogy connecting to the Maze Runner Trilogy? Now I know that this would most likely never, ever happen, even though Dashner is fond of the Divergent Trilogy, it is illogical. But still, I just like to think that these two trilogies could be connected – by the same scientists, or what not – just figured I’d share my thoughts. Tris IS part Abnegation and Four is one at heart. Yes they’re both Dauntless now but maybe holding hands is still the equivalent to kissing to them and kissing is the equivalent to.. 😀 Plus there’s the whole people dying left right and centre thing which might be a bit of a turn off. So in my mind it makes perfect sense. I Just finished Insurgent. I mean, minutes ago and I’m not sure what you meant about immune Divergent either. Immune to the ‘poison’? Or what? I Liked Tris and Four and they’re Young (and Abnegation),so they likely wouldn’t be getting it on. I was annoyed by the lying/not opening up, though. And I liked this book better, I think, than the first. Waiting for the next! Oh, one thing!… Tris gets the stunner and no gun (can’t shoot),then immediately Shoots the lock off the door. Then, gets through the window and says she left the stunner in the other building and is Unarmed again. Which is it?! after watching the movie divergent online which i found amazing i have never watched action movies but this one was different influencing me to watch it over and over and i couldnt wait next year for insurgent so i ordered the book and read it in 2 days as if im watching the actual movie and experincing it wow ive got to say ive never read a book in years and veronica roth the author has changed my view an amazing author i would really love to meet her in person once and know i cant wait to watch insurgent its gonna be a movie im gna loooove and the ending epic!!! !